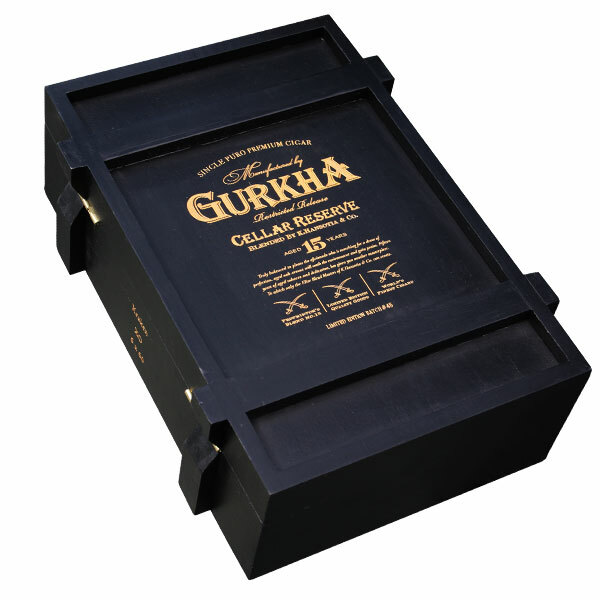 Two years after Gurkha unveiled the wildly popular Cellar Reserve, the brand followed up the release by “going to the dark side;” offering the same 15-year-aged tobaccos under the guise of a new, Brazilian Arapiraca Maduro wrapper. Fans of the original can expect a similar presentation; offering the same wine crate-style boxes and vintage wine label bands. Only this time Gurkha has flipped the coloring scheme, bringing a much more sinister presentation with black boxes and matching black and gold bands. Gurkha Cellar Reserve Limitada cigars are rolled in similar sizes to the original as well, showcasing primarily intricate figurado shapes and pigtail caps. But the cigar’s darker wrapper imparts an added sweetness and amped-up body, delivering a new layer of complexity to this fan-favorite blend. The cigar uses a similar filler blend that is highlighted by the vintage, 15-year-aged Dominican tobaccos in the cigar’s filler. The end result is a complex, dessert-like smoke, offering sweet notes of espresso coffee, earth, black pepper, dark cocoa, and a subtle orange zest.